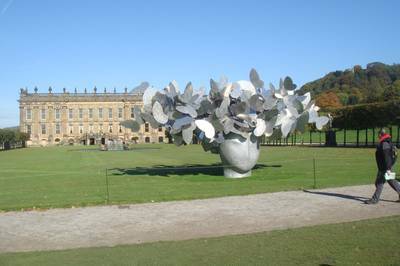 Derbyshire and the Peak District is blessed by some of the finest great houses and halls anywhere in the UK - including, of course, Chatsworth, recently voted the nation's favourite Stately Home. Haddon Hall is an English country house on the River Wye at Bakewell, Derbyshire, one of the seats of the Duke of Rutland, occupied by Lord Edward Manners and his family. In form a medieval manor house, it has been described as "the most complete and most interesting house of its period". Details: Haddon Hall near Bakewell, Derbyshire - for more than 200 years, from 1702 to 1920, this enchanting old house in yellow and grey stone remained undisturbed, abandoned by its owners. The great rooms of the house, the exquisite Long Gallery, the six hundred year old Great Hall and ancient Chapel all lay silent. John, 9th Earl of Rutland, had been created Duke of Rutland and had decided that the other great house which he had inherited, Belvoir Castle, would provide a more suitable residence. As a consequence of his decision, Haddon Hall was left untouched for the next two centuries, its gardens completely overgrown. 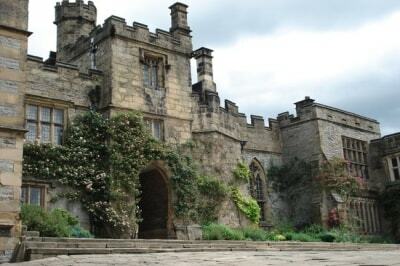 It was the present Duke's father who on visiting Haddon in his youth, fell in love with the place and decided to make it his life's work to restore it to its former glory. It is really due to him that this fine old house can still be seen by visitors from far and wide and, since it became the county's favourite film set, by millions of film and TV viewers. Those in the know visit Haddon in the spring or autumn, when the crowds are gone and the place simply soaks you with its unique charm, and again in the summer to see at their best the beautiful gardens of the finest surviving Medieval house in England. Bess of Hardwick acquired Hardwick Old Hall after her brother, the former owner, died in a debtor's prison. Then following an irrevocable quarrel with her husband, she moved in without him and transformed it into one of the greatest Elizabethan mansions in the country. The view from the West Tower is magnificent, and the Hall provides the venue for various special events throughout the year. The Hall Bess built next door is regarded as one of the finest Elizabethan buildings in Europe and houses fine collections of tapestries, needlework and furniture. Outside are stunning gardens designed in the manner of the period. Tucked away in the Peak District's wild rolling hills lies the Tissington Estate. This is the perfect venue for a fairytale wedding, garden opera, private party or exclusive corporate event. Whatever the occasion, Tissington Hall is a beautiful backdrop with a timeless atmosphere all of its own. Tissington Hall is an intimate and romantic setting for the most important day of your life - your wedding! Our licence allows couples to marry in the Main Hall, a beautiful stone flagged Jacobean ballroom with beautiful Gothic fireplace and Chippendale furniture. Celebrate afterwards in the oak panelled opulence of our dining room or under canvas in our extensive grounds which include: a private ten-acre arboretum, lawns, terraces and stunning rose gardens. Tissington Hall is a unique and impressive venue for corporate events, team building exercises and management training days. The History of Tissington can be traced back as far as 1086, when it is mentioned as Tizinctun in the Domesday Book, among the possessions of Henry de Ferrers. In the reign of Elizabeth I, Francis FitzHerbert, who was the great grandson of Nicholas purchased it and so the Monor of Tissington became re-united. Since that time, the history of the village has been inextricably woven with that of the FitzHerbert family, who still occupy the Hall and govern an estate extending from Bradbourne Mill in the east, to the river Dove in the West. The Hall and Gardens are open for pre-booked group tours throughout the year. Renishaw Hall is a stately home in Derbyshire which dates from the 17th century. It is a Grade I listed building. There is a beautiful 300-acre park, eight acres of the most important Italianate gardens in England, and a house full of treasures large and small collected over many centuries. This is open by appointment to the public for exclusive and intimate tours with knowledgeable and friendly guides to tell you about the family, the artefacts they have collected, the history of Renishaw and to answer any questions you may have. Renishaw Hall Gardens make an excellent day out for families as well as garden, history and art enthusiasts. Come and spend a day with the whole family - walk, enjoy the children's trails and magic garden, and stop for lunch in the cafe. The building is 300 yards long and overlooks the park. Rex Whistler, one of the many artists sponsored and patronised by the Sitwells at the beginning of the century, called it "the most exciting place I know". 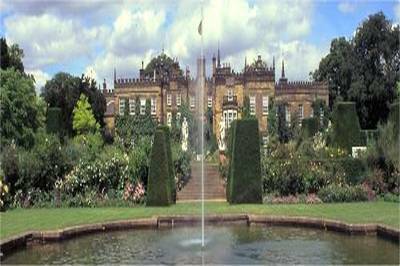 The BBC version of Pride and Prejudice used footage shot at Renishaw Hall. D. H. Lawrence is said to have used the local village of Eckington and Renishaw Hall as the inspiration for his novel "Lady Chatterley's Lover". 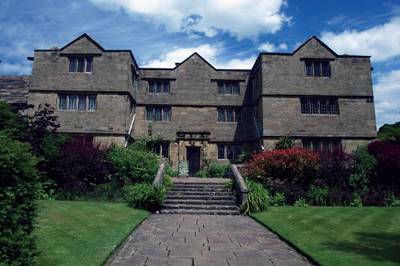 At the heart of the 'Plague Village' of Eyam, lies Eyam Hall. An imposing manor house, it is still very much a family home and visitors will appreciate the welcoming and homely atmosphere -scattered among the antiques and fine china, they are likely to see the belongings of the present family! The house was built in the 17th century with profits from the local lead mining industry. Over the centuries succeeding generations have added to the contents so that now the house is a treasure trove of every type of artefact. A fascinating feature is the tapestry room, where sections of tapestry have been cut up and nailed to the wall, like wallpaper. The old kitchen can still be seen in all its glory with a magnificent fireplace and numerous old domestic items. The historic farmyard now houses a craft centre where visitors can watch craftspeople at work and purchase authentic local products. Also here, right next to the house, is the newly expanded Buttery offering cakes and light lunches and open to visitors to the house and others. Have a glimpse of history in miniature as you tour through this delightful 17th century manor house with an entertaining and informative guide. Hear about three centuries of Wright family ancestors in the historic 'plague' village of Eyam. Visit the Craft Centre and licensed Buttery. You can even get married here! A glorious mansion house, surrounded by stunning gardens, moorland and ancient deer park. The mile-long drive to Lyme Parkcreates a real sense of anticipation, which the house more than matches up to. Originally Tudor, it now resembles a fabulous Italianate palace. Inside there are incredible Mortlake tapestries, an important collection of clocks, beautifully furnished rooms, along with a colourful family history. Stroll through the opulent Victorian garden, with its sunken parterre, or the Edwardian rose garden. 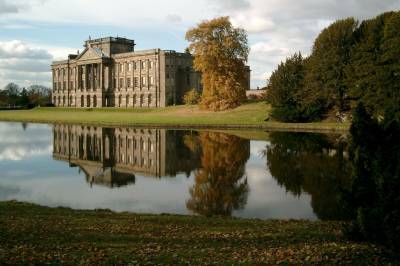 Enjoy the luxurious Jekyll-style borders and Wyatt-designed Orangery, sit on the grass, or wander lazily by the lake (where Darcy and Elizabeth meet at 'Pemberley'), then venture beyond the garden, where the medieval deer park stretches into the distance; the vast moors and parkland are home to fallow and red deer. Seek out The Cage, an 18th-century hunting tower, or explore the woods and discover the lantern folly, with its breathtaking views. Delicious food, including venison from the park, is prepared in the Lyme kitchens; and with retail therapy at hand, Lyme really is a glorious day out. Turn the pages of history at Lyme Park, with our interactive display which lets you view the pages of the Lyme Caxton Missal. The Missal was printed by William Caxton, England's first printer, in the 15th century. It is a rare copy of an early printed prayer book, famed in its time of print for being one of the first books to be printed in two colours, red and black. 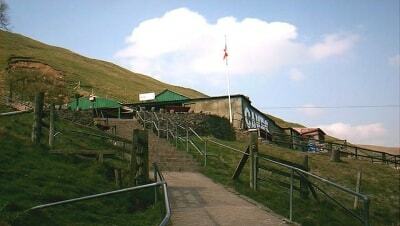 Derbyshire's famous caverns and show caves are the jewel in the Peak District crown seat at Castleton, Hope Valley. The Peak Cavern, also known as the Devil's Arse (called so because of the flatulent-sounding noises from inside the cave), is one of the four show caves in Castleton. Peakshole Water flows through and out of the cave. Unlike the other show caves in the area, it is almost entirely natural. The only artificial part of the cave was blasted to bypass a low tunnel that was only accessible by lying down on a boat, and the cave system is the largest in the Peak District. Set in the middle of the picturesque Peak District village of Castleton, the approach to Peak Cavern is awe-inspiring. A riverside walk takes you past centuries old miners' cottages, opening out into a stunning limestone gorge. Ahead of you are 280ft high vertical cliffs, with the ruins of Peveril Castle towering above. Deep into the cliff is the Cavern's imposing entrance chamber - the largest natural cave entrance in the British Isles. Within this entrance chamber you will see the remains of an ancient village where a whole community lived and worked making ropes for the local lead mines for more than 400 years. As you venture deeper into the Cavern you will hear the amazing acoustics of the Orchestra Gallery in the Great Cave, see a continuous cascade of water at Roger Rain's House, pass through Pluto's Dining Room into the Devil's Cellar where you can hear the source of the river Styx. Guided tours, including traditional rope making demonstrations are available at regular intervals, with detailed information about the Cavern's history and development. 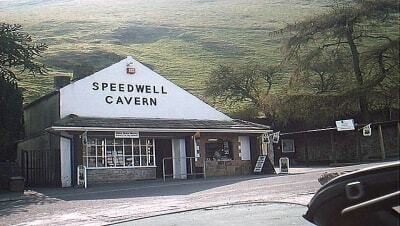 The Speedwell Cavern is another one of the four show caves in Castleton. It consists of a horizontal lead miners' adit (a level passageway driven horizontally into the hillside) leading to the cavern itself - a limestone cave. The lower part of the adit and the floor of the cavern are always flooded, resulting in Speedwell Cavern's unusual feature: the visitor makes the journey into the cave by boat. At the end of the adit, the visitor gets out the boat and walks into the cave to see the fluorspar veins, the stalactites and stalagmites, and the so-called 'Bottomless Pit'. Enter the inner world of the underground cave system in the heart of thePeak District National Park and soak up the atmosphere as a watery silence echoes all around you. Set at the foot of the stunning Winnats Pass, high above the village of Castleton, Speedwell Cavern takes you on an unbelievable underground boat journey. Glide silently through the workings of a 200 year old lead mine. Imagine what it must have been like to carve out these tunnels using only the most primitive tools as your guide retells the story of the mine which opens into a network of natural caverns and underground rivers. Visit the gift shop and take home something to remember the peculiar splendour of your journey into the depths of speedwell cavern. A wide choice of gifts and mementos is available including jewellery made from the exclusive Blue John stone - the superb fluorspar mineral unique to the Peak District Caverns. Treak Cliff Cavern is of international fame and geological importance. It has been a designated a Site of Special Scientific Interest for many years and by agreement with English Nature all the Blue John Stone deposits on the visitor route are preserved. Treak Cliff Cavern is renowned as the most beautiful of Castleton's caverns - an underground wonderland of stalactites, stalagmites and flowstone, rock and cave formations, minerals and fossils, all of great interest and beauty. Thousands of casual visitors, schools and organised parties have already enjoyed the tour through the Dream Cave, Aladdin's Cave, the Fairyland Grotto, the Dome of St Paul's, the Fossil Cave and the Witch's Cave during a quarter mile tour lasting about 40 minutes. The caverns are tastefully illuminated by electric lighting and the footpaths are clean, safe and non-slip with steps here and there to make the going easy. Enter an Ancient Underground Wonderland in the Heart of the Peak District National Park. Your guide will explain how miners in the 1750's constructed a tunnel using only hand tools to reach the Blue John Stone deposits inside the hill. You will see veins of Blue John Stone across the cave roof, and 'The Pillar', the largest piece ever found. Your guide will point out fossils in the limestone rock which formed the hillside above you 330 million years ago. You enter the mysterious Witch's Cave where even richer deposits of Blue John Stone are revealed. The guided tour descends even deeper into the hill where you will experience the wonder of underground limestone cave formations. Multi-coloured flowstone adorns the walls of Alladin's Cave. Stalacites and stalagmites decorate Fairyland and the Dream Cave. The most famous formation is 'The Stork', standing on one leg! During your tour the guide will explain where Blue John Stone came from, how rushing water made the caverns, and how stalactites are formed. Back on the outside, you can enjoy tea and coffee made from water collected inside the cavern, or browse in our shop where there is a selection of jewellery and ornaments made from Blue John Stone. Attentive service is offered in the shop and kiosk and the helpful and informative guides will be pleased to answer any questions. The Blue John Cavern is yet another one of the four show caves in the Castleton area of Derbyshire. The semi-precious mineral 'Blue John' or 'Derbyshire Spar' is mined from this cave. Although the cavern works as a show cave, the mineral is still worked here during the winter months. The miners who work the remaining seams act as guides for the underground tours. Blue John is a blue/purple and white/yellow banded variety of fluorite found only here and at the nearby Treak Cliff Cavern. However, blue fluorite occurs widely throughout Derbyshire and especially in the Ashover and Crich areas. The Cavern Tours are of enormous educational interest showing plainly how the caverns are formed in limestone strata and how the limestone itself had much earlier been formed by the deposits on the floors of great oceans which have long since receded, as the fossilised remains of marine animals now show. The Cavern is well illuminated by electric lighting. Very thorough planning was necessary here to ensure that the whole project was complementary to the caverns as a whole, without appearing to intrude or commercialise the caverns in any way. It has been suggested that the Blue John Cavern is the finest that can be seen by the general public in Western Europe. There is also a craft shop with a wide variety of Blue John jewellery set in silver and gold, alongside Blue John Ornaments such as bowls, eggs, and goblets. Starting point: The car park on the A6013 north of Bamford near the Ladybower Reservoir. Distance approx: 13 miles, Ride suited to good mountain bike riders. With its beautiful, rugged gritstone moorland and scenic reservoirs, this area of the Dark Peak has long been a magnet for mountain bikers from the nearby cities. There are some excellent routes close by some big loops and day circuits but this circuit of the Lady Bower Reservoir is less strenuous but nonetheless very enjoyable and equally rewarding for a quick weekend jaunt. From the car park on the A6013 just north of Bamford ride the short distance along the road to meet the A57. Turn left along the A57 towards Ashopton, turning right just before the bridge and right at the hairpin shortly after. Join the bridleway climbing up the hill to Highshaw Clough and follow it left to Whinstone Lee Tor. The track now follows the stone wall before dropping down towards the forest and then on to the reservoir. Turn left and follow the banks of the reservoir back to the A57. Now turn right, then right again after the bridge on the opposite bank. Follow the road for about 2km. When you are level with an inlet on the opposite bank, take the bridleway on your left and climb through the forest to Hagg Farm. Turn left at the bridleway junction on to the switchback descent. Go straight across the A57 down to the river and left after the bridge. 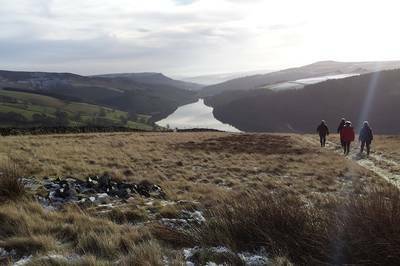 Stay on this track alongside the river, then the southern bank of the reservoir round to the Ladybower Dam. Cross the dam and turn left on the A6013 to bring you home to the car park. If you need drinks or food after this little jaunt then head to the Lady Bower Inn which is open every day from 12 noon. Bed and breakfast is also available here. Carsington Reservoir. Starting point: The car park at the Visitor Centre at Carsington Water which can be found near Matlock off the A6 towards Wirksworth and off the B5035. Distance approx: 9 miles. Ride suited to all cycle and mountain bike riders. This area is suitable for children who have done their cycling proficiency or if staying near the visitor centre very young ones with supervision. There is ample parking here at the visitor centre which is Pay and Display so don't forget. There are good facilities here for all needs. Most of the route is reasonably flat with hilly bits to keep you awake as the track climbs over little spurs between the streams which run into the reservoir. The route is well marked out and is on good surfaces but in the woody sections the paths can be slippery in wet weather. Head towards the Sailing Club, which you pass on your left side to leave the far end of the car park on a track and then follow this to the end of the dam and then cross the dam. There are plenty of birds here if you are a twitcher, so bring the binoculars. At the end of the dam, turn left into Millfields car park which is another option for starting the ride if the visitor centre is full, cycle through the picnic area to continue out along the track that runs by the reservoir. After a third of a mile you climb to a T-junction at an unmade road. The track turns left here downhill before turning right again along the trail. The next portion of the trail winds its way through the woods and then comes out at a T-junction, this time turn left and descend back towards the lake before following the trail right on the edge of the woods. Through a fairly dense wooded section of the trail you eventually emerge at the head of the lake and the B5035 road. You go left alongside the road for a short distance and then cross the road, following the track up into the small village of Hopton, the home of the Gell family, who were local lead-mine owners and wealthy with it. Cycle along the road, past Home Farm and Hopton Hall and then into the village of Carsington, which has the Miners Arms where you might need to stop for refreshment. Straight after the pub the road turns sharp left and head back to the B5035. When you reach the road cross straight over it and pick up the trail again which goes to the right of Shepherds car park. The trail then heads undulating back to the Visitor Centre. Tissington Trail, suitable for families. Starting point: Parsley Hay to Hartington signal box or further. Distance approx: Depends on how far you want to go and where from. Ride suited to mountain bike riders and is suitable for young children. If you head south from the Parsley Hay visitor's centre keeping to the right when you come to a junction with the High Peak Trail, after cycling through the railway cuttings you come to the former signal box at Hartington this has been turned into a Visitor Centre and refreshments are available here from Easter to the end of October and on Bank Holidays and weekends. Hills, hills and more hills: Starting point: Great Longstone. Distance approx: 38 miles. Ride suited to good fit road cyclists. It is designed for training or looking at cracking views on quiet roads with plenty of hills. Great Longstone is a lovely quiet village, still thriving with a shop that sells everything, a butchers, a dairy where you can buy milk 24 hours a day, a school, tennis court, park for the little ones, cricket pitch, two pubs (the White Lion and the Crispin) offering food and drink most days of the week. So this is where you start from, so if you have forgotten food or drink you are okay topping up here before putting on the cycle shoes and heading off. Head down the village from the centre towards Bakewell, past White Peak Butchers and Casey's Shop and down to the bridge at the bottom of the village, take a left and join the main road going under the Monsal Trail Bridge and round the switchback bends to the Hassop roundabout. There is a bookshop on the right of the roundabout but don't be diverted go straight on over the roundabout and at the next T junction turn left and then immediately right signposted to Pilsley. The road heads downhill and then an incline up takes you towards Pilsley village don't stop here at the Chatsworth Farm Shop on the right but go straight down to the next T junction and take a right down hill, over the cattle grid and past Edensor Village and don't go left into Chatsworth House, nice though it might be to sit on the grass with the sheep and the tourists on a warm summer's day, when we get them! Go on through the beautiful park avoiding the lambs and the deer over another cattle grid and round the corner to the bridge traffic lights. You have Chatsworth to your left and over to the Hope Valley on your right. When you have taken time to breathe in the good air and admire the views then push on down the hill, there is a very severe left hand turn so go steady down the hill this is Bar Road. As you hit the houses there is a crossroad, you need to go right along here it's called as you go along The Bent, maybe how you are feeling, straight along here right to the end at another crossroads at Froggatt. Summon your energies and go right up the longest hill of the day at two and a half miles up past The Chequers pub and restaurant on your right and keeping grinding in the granny gear until you go past yet another pub, The Grouse Inn, and up past the Longshaw Estate on your left. You are riding here under Froggatt Edge and you will feel this pull up, stay right on the edge of the road as again, boy racers love the bends on this road and will take you out if you are any where but on the edge of the tarmac! You have been warned! This road is the A625 and when you reach the junction gasping for air take a left where it levels a little to allow you to take the view in on your left over the Hope Valley and over to Castleton. Stay on this road ignoring the turning to the right for Sheffield and go on to the junction with the A6187 forHathersage where you head left but ignore the first turning for Nether Padley and head down into Hathersage. If you are in need of a stop as you are now over half way at 23 miles you could try the Fox Houses Inn where there are facilities, don't eat too much though as you still have about 14 plus miles to go and some more uphill yet. Here you can see the affect of quarrying on the Edge where there is a long standing dispute over quarrying rights going on. You then follow the road round to the right as you come to the top and then head down hill into Great Longstone and you are back to the start. Attractions for all the family to enjoy in and around the Peak District National Park. From beautiful and very grand stately homes to donkey sanctuaries, stone henges, delightful dales, splendid estates, theme parks, great days out, ancient caverns and caves, fabulous farm shops and more. This unique outdoor heated swimming pool, which is owned and managed by Hathersage Parish Council, is set in a lawned enclosure with a covered veranda to one side. It gives users the opportunity to swim in the open air, amidst the glorious Peak District scenery and in beautiful warm water, which is heated to 84°F / 29°C. Regular users take advantage of the uniquely warm water and swim throughout the season. Our refurbished changing cubicles and hot showers will add to this pleasurable experience. We look forward to welcoming you to Hathersage pool. Group bookings may be made during public sessions. Private parties can be booked on Saturdays and Sundays from 5pm to 6pm. We can cater for private parties, independently or in conjunction with the swimming pool or hard play area. We run Aqua Fun sessions with a variety of floats and pool toys, as well as occasional scuba sessions and other fitness activities, such as Aquarobics. We serve food, drink, ice cream and sweets from 8am until the pool closes. Eat directly at the poolside, inside in the cafe or outside on our large patio area. Our menu includes homemade meals, soups and cakes, with healthy and vegetarian options. We have a full takeaway service which includes freshly battered fish and chips. Buxton Opera House is in The Square, Buxton, Derbyshire. It is a 900 seat opera house. The Opera House was built in 1903 and designed by Frank Matcham, one of Britain's finest theatre architects.It ran as a successful theatre, receiving touring companies until 1927, and also became the venue for an annual summer theatre festival from 1936 to 1942 in conjunction with the London-based Old Vic company. In the intervening years it served as a cinema. In 1979 a major restoration took place with people both from the local area and across the UKhelping with the work. Buxton Opera House is one of Britain's leading receiving theatres, presenting around 450 performances each year including dance, comedy, children's shows, drama, musical concerts, pantomime and opera as well as a lively Fringe Theatre and Community and Education Programme. The theatre is also home to the prestigious Buxton Festival and The International Gilbert & Sullivan Festival and The Four-Four-Time Festival of Live Music. Lovingly restored to its former glory in 2001, Buxton Opera House is an exquisitely beautiful Edwardian theatre and one of the country's finest examples of Frank Matcham theatre design. Check the Opera House's own website for details of productions and ticket prices. Alton Towers is a theme park and resort situated in the grounds of a former stately home in Staffordshire. It attracted 3.1 million visitors in 2008, making it the second most visited theme park in the UK after Pleasure Beach Blackpool. It is based north of the village of Altonin Staffordshire (approximately 16 miles east of Stoke-on-Trent) and just outside the Peak District, in the grounds of a semi-ruined Gothic revival country house of the same name, the former seat of the Earls of Shrewsbury. There's something for the whole family, with tons of terrific rides, astounding live shows, and weird and wonderful costume characters. TheAlton Towers Theme Park has extraordinary, fun-packed activities for all ages - scream, let off steam, ride and slide. The Theme Park has a breath-taking selection of BIG RIDES. Enter X-Sector for Oblivion and Submission. Explore Forbidden Valley for Nemesis, Air and Ripsaw or stop off at Ug Land for the unforgettable Rita! Up for a bit of light hearted fun with friends and family? The amusement rides at the Alton Towers Resort make for haunting experiences. Laugh yourself silly and scare yourself witless - there is so much fun to be had with laughs and fun frights at Alton Towers Resort's amusement rides. Ideal for all the family, the Alton Towers Resort offers family rides packed with fun for little kids. Feel safe and secure that there are loads of rides and activities to keep all ages happy, all day long. So whether you're young or old, or part of a family, you'll love Alton Towers Resort's family rides as you spend quality time with your loved ones. Visit Alton Towers' website for details of opening times and admission prices. The Upper Derwent Valley is the Peak District's Lake District. Dominated by the triple reservoirs of Howden, Derwent and Ladybower, which flooded the valley to slake the thirsts of the booming industrial populations of Sheffield, Derby, Nottingham and Leicester, this is the biggest expanse of open water in the Peak. And that mixture of water, trees and high, enclosing moorland is very popular with visitors. Over a million and a quarter people throng the Upper Derwent annually, making necessary an award-winning traffic and visitor management scheme. The upper end of the valley, from Fairholmes northwards to King's Tree, is closed to traffic on summer weekends and Bank Holidays, when a mini-bus and cycle-hire service comes into operation. 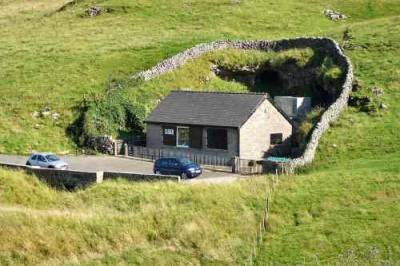 There is a National Park visitor centre and cycle hire centre at Fairholmes, in the shadow of the Derwent Dam. The upper two dams, the Howden and the Derwent, were built between 1901 and 1916, employing an army of over 1,000 navvies and their families who were housed in a temporary village at Birchinlee, between the two dams, while the work took place. This self-contained community had its own shops, recreational hall, hospital, police station and school, housed in nearly 100 corrugated iron structures, which gave the settlement its local nickname of 'Tin Town'. The bustling community boasted a range of shops, a recreation hall, school, hospital, "canteen" (as the pub was known), and a police station. The site of Tin Town is now lost in the forestry planted in the interests of water purity after the dams were built, but a plaque records its existence in a layby just below the Howden Dam. 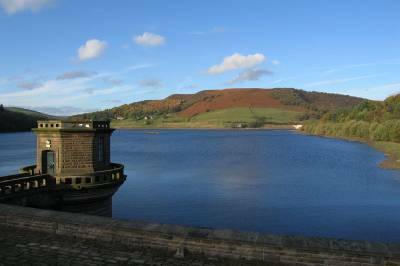 The third and largest reservoir and dam was the Ladybower, constructed between 1935 and 1943, which necessitated the demolition of two ancient villages which once stood in the valley bottom at the foot of the Snake Pass. The populations of both Derwent and Ashtopton were re-housed at Yorkshire Bridge, Bamford, and 100 dead from the churchyard were reburied at Bamford. The foundations of their homes, the church and the Victorian pile of Derwent Hall can still be seen in times of drought or when the water is drawn down. 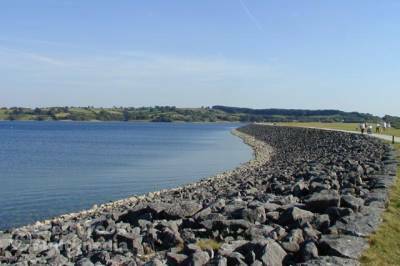 The other famous story of the Upper Derwent is that of the Dambusters, because it was here that the brave crews of 617 Squadron trained in their specially adapted Lancaster bombers for their epic raid on the Ruhr dams in May, 1943. There is a memorial to the airmen who lost their lives in the raid in the western gateway to the Derwent Dam. At Crich an old once abandoned quarry has been transformed into the Crich Tramway Village, home of the National Tramway Museum. It is packed with exhibits including preserved static trams from many countries, together with a large collection of tram memorabilia and also the Workshop Galleries, where you can watch trams being restored. The trams at Crich mostly ran along the streets of cities in United Kingdom before the 1960s, with some trams rescued and restored (even from other countries) as the systems closed. 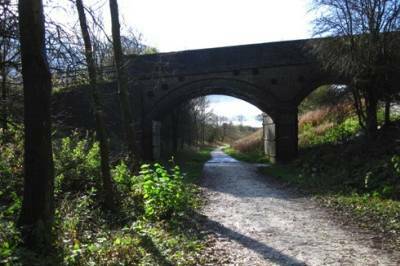 The town of Matlock is close by and the nearest train service is from Whatstandwell railway station on the Derwent Valley Line (Derby-Matlock line), with a steep walk up to the museum at the top of the hill. Best of all are the unlimited Tram rides. There is an operational tram route which offers rides on many of the tram exhibits. Be a passenger on vintage trams from all over the world. Ride through history as many times as you like, with trams running every few minutes, you can enjoy riding through the period street, beneath the elegant Bowes-Lyon Bridge originally constructed in 1844, and on past spectacular views of the Derwent Valley to the Glory Mine terminus 810 feet above sea level. Public tram Driving courses are also on offer several weekends each year for those that want to take their interest one step further. For those requiring refreshment there is a tea room, the Red Lion Pub and Restaurant and an Ice Cream parlour. Check the website for opening hours and any admission charges. This splendidly romantic castle, perched on an imposing bluff which commands the valley below, was built in the first half of the 17th century by Sir Charles Cavendish and his son William (created first Duke of Newcastle). A romantic by nature, Charles built for himself what was essentially a miniature mansion with mock-medieval fortifications in the form of extravagant turrets and battlements. The house is richly decorated in Jacobean style, with carved fireplaces and impressive rooms. In the stateroom wing built for William, which is now roofless, it is easy to imagine entertaining Charles I to banquets and masques. Visitors will find plenty to explore, including the 17th century riding school, one of the oldest in Europe and in its time one of the most famous. Picnics are welcomed and there is a gift shop and a tape tour is included in the admission price. The subscribe button will only work if you have entered your email address correctly.